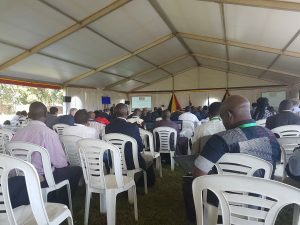 The event takes place at the Water Resource Institute, Entebbe which is a city on the Lake Victoria peninsula around 37 km southwest of the capital city, Kampala. DFMS has an exhibition stand throughout the week, where you can come and meet some of the team, have demonstrations and discussions over what DFMS is and the value it could bring to your organisation! Unlike most UK events, the conference and the exhibition are in the open air as you can see. The DFMS team are also presenting two papers this week. Yesterday, Tuesday 19 March, Hermen Westerbeeke (RHEA Group) presented the paper ‘The Role of the Service Model in Sustainable Development – the example of DFMS’ in the Water-food-energy and ecosystem nexus session. 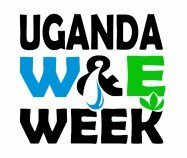 When this blog gets published on the morning of Wednesday 20 March, I’ll be in the Water, Sanitation, Environment and Society session presenting ‘Understanding Water Availability within Ugandan through the Drought and Flood Mitigation Service’. My paper will outline the work we’ve done using Earth Observation data to provide details on Land Surface Temperature, Soil Moisture, Water Extent and Water Height in Uganda. It uses a combination of free-to-access optical and radar data to provide these measurements, all of which will be available within DFMS. DFMS is an online suite of data and information products that will allow decision-makers in Uganda to mitigate the impacts of drought and floods and take better-informed water, environmental, and agricultural management decisions by providing access to robust meteorological, hydrological, and other Earth Observation information. The development of DFMS is part of the UK Space Agency’s International Partnership Programme and is led by the RHEA Group together with a consortium of UK organisations: the UK Met Office, HR Wallingford, Pixalytics Ltd, Environment Systems; AA International, Databasix, coupled with support in Uganda from AgriTechTalk Africa and Mercy Corps. The week began with a keynote presentation from Peter Koefoed Bjørnsen, Director of UNEP/DHI Water and Environment Centre, Denmark. His presentation was ‘Water and Environment -a strategic driver in the attainment of Sustainable Development Goals 2030’. 6.3 Water Quality: Global modelling and remote sensing indicate water quality issues in at least a third of river basins. 6.4 Water Scarcity: A third of the global population is heading towards this situation. Uganda has slightly more than average rainfall over land, but more irregular and reduced rainfall over Lake Victoria. England is also within this category with the UK Environment Agency stated yesterday that the country will have water shortages with 25 years unless attitudes to wasting water change. 6.6 Protect and restore water-related ecosystems, including mountains, forests, wetlands, rivers, aquifers and lakes: Globally, and within Africa, wetlands are declining by 40%; in Uganda, Wetlands cover 8% of the country. The importance of remembering that water, climate and the environment are inseparable. Uganda was one of the first governments to align its priorities with SDGs and is progressing well, but more progress is needed. Attainment of the SDG water goals not very good across many countries, whilst in Uganda they are moving in the right direction, but monitoring is key. 69% of freshwater in Uganda originates from outside Uganda. Less than 15% of people in Kampala are connected to the sewerage system, and this number is going down as Kampala grows. Work is underway to put in place more sewers. There are a lot of interesting looking presentations and discussions coming up during the rest of the week. There is also an exciting programme of environmental social activities taking place including the Entebbe Municipality clean-up exercise, a forest run, site and field visits, a march through Entebbe and the week will be closed with a speech by the Prime Minister of Uganda on Friday afternoon. International Day of Forests 2019 takes place on the 21st The United Nations declared that International Day of Forests, to be first observed in 2013, to celebrate and raise awareness of the importance of all types of forests and of trees outside forests. The theme this year is ‘Forests and Education’. World Water Day 2019 takes place on the 22nd March and this year has the theme of ‘Leaving no one behind’. Adapting the promise of the 2030 Agenda for Sustainable Development: as sustainable development progresses, everyone must benefit. The United Nations declared the first World Water Day in 1993 to promote water conservation and sustainable management. World Meteorological Day takes place on 23rd March 2019. It celebrates the coming into force of the Convention establishing the World Meteorological Organization on 23 March 1950, by showcasing the contributions of National Meteorological and Hydrological Services to the safety and wellbeing of society. The theme this year is ‘The Sun, the Earth and the Weather’. It’s been a great opportunity to discuss Earth Observation with friends and colleagues in Uganda, and I have still got a few more days to go! This entry was posted in Data, Earth Observation, Education, ESA, MODIS, NASA, Remote Sensing, Research, Satellite, Space Industry, Uganda IPP, UK Space Industry and tagged clean water, DFMS, Drought and Flood Mitigation Service, Earth Observation, Entebbe, information, International Day of Forests, International Partnership Programme, Land Surface Temperature, online, sanitation, soil moisture, Sustainable Development Goals, Uganda, Uganda Ministry of Water and Environment, Uganda Water Week, water, Water Body mapping, water extent, Water Height, World Meteorological Day, World Water Day by Sam. Bookmark the permalink.